BOP is the exclusive intellectual property of Worden Brothers, Inc. It was developed by Don Worden, a leading technical innovator and writer dating back to the nineteen fifties. In 1994 he was the recipient of the award for significant contribution to technical analysis, given annually by the Market Technicians Association. BOP tells you whether the underlying action in the trading of a stock is characterized by systematic buying (accumulation) or systematic selling (distribution). The single most definitive and valuable characteristic of BOP is a pronounced ability to contradict price movement. BOP goes far beyond the "divergences" that many technical indicators are capable of. In divergence analysis, the price and the indicator tend to move together. A divergence is detected when, for example, the price makes a new high and the indicator fails to confirm. BOP is capable of outright contradiction. Thus, while the price is attaining new highs, BOP may very well be attaining new lows. It is not unusual for BOP to move in the exact opposite direction of price. BOP is plotted above and below a zero line. However, it is not an oscillator. It does not swing up and down with the price. It goes its own way, often quite independent of price movement. When BOP is above the zero line, it is depicting systematic buying. When it is below the line, it is revealing systematic selling. Where y is the period of an optional simple moving average applied to BOP which must be an integer. Where z is the offset. An offset of 1 is 1 bar ago. The current Balance of Power can be written as follows. But both the period and the offset are optional in this case, so it can be shortened to the following. The BOP of 5 bars ago can be written as follows. The 3 period simple moving average of the current BOP can be written as follows. The 4 period simple moving average from the previous bar can be written as follows. For convenience, BOP is plotted in color. Green signifies dominant buying, red dominant selling. When BOP is close to the zero line, revealing no clear dominance of either buying or selling, it is plotted in yellow. (This is all patterned after stop and go lights). BOP fits into a category of devices that can be termed "trend quality" indicators; a variety of methods lead naturally to buy and sell signals. What BOP tells you is something about the quality of the underlying trend. Not itself a pinpoint timing indicator, BOP will modify your assessment of the vital risk/reward ratio of a trade or investment. It will help you determine whether the supply/demand balance will be in your favor. It will help you spot changes of character in a stock's action. Why isn't BOP a perfect indicator? First, because there is no such thing as a perfect indicator. What BOP does, it does extremely well. BOP brings out hidden patterns of accumulation or distribution, and it does so with great reliability. But you see, a significant increase in price is not the inevitable result of informed accumulation. Distribution does not inevitably lead to a collapse in price. Even well informed buyers and sellers can be wrong about future price trends. BOP offers an inside glimpse of informed accumulation or distribution, not a sure-fire key to riches. Let us just say that if you invest consistently in the same direction as informed money, your chances of success will increase significantly. Watch particularly for changes in character at potential tops and bottoms. Be suspicious of stocks in which BOP hasn't worked well. If the BOP pattern was misleading in the past, it will probably continue to be so in the future. Look for charts where BOP has shown selling at tops and buying at bottoms. Look for honest charts and avoid the double-crossers. The BOP scale runs from 100 to -100. The indicator itself can rise above or below these extremes, but it is relatively rare. When it happens, we just truncate the profile at the top or bottom of the chart. 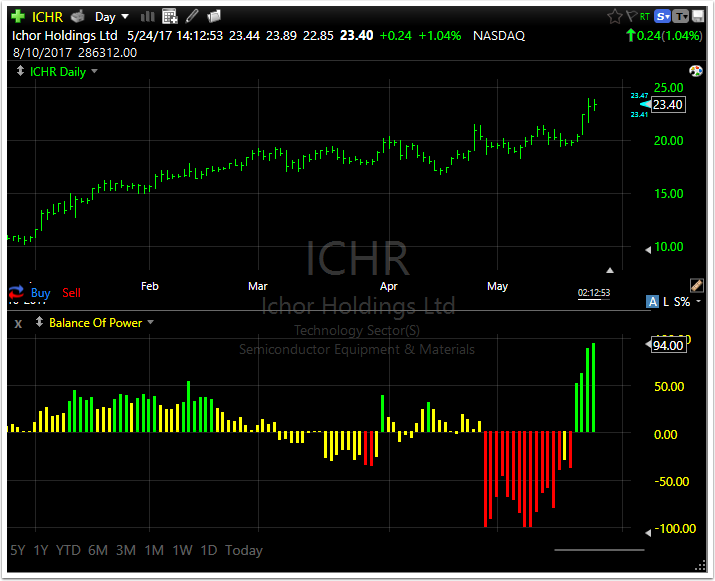 Since the scale is consistent from chart to chart, you are able to make direct comparisons from stock to stock. Some will ask, which is the most important: (1) Whether BOP is above or below the zero line? Or (2) Whether the direction of the BOP profile is up or down, which is to say, whether BOP is improving or deteriorating? Of first importance is whether BOP is above or below the zero line. This indicates dominant buying or selling on an absolute basis. However, a positive BOP with a deteriorating pattern can be significant as well, but only in a divergent situation. Thus, a positive BOP moving down in tandem with an eroding price could not be interpreted bearishly. However, a positive BOP moving down into a rising price must be construed bearishly. This would be all the more so if the price is actually attaining new highs. Conversely, a positive BOP moving up into a falling price should be interpreted as a positive, and all the more so if the price is breaking so-called "support levels." Where absolute BOP versus improving or deteriorating BOP seem to be contradictory, you will often find that, the answer lies in the time implications. Absolute BOP (green or red) usually has the longer-term implications. One last point; before you arrive at a decision on any stock, check BOP (as well as all other indicators you find useful) in a variety of time frames. Even if you are a so-called day-to-day "scalper," you will benefit greatly by being aware of a stock's pattern over a period of at least five years. For scanning purposes, Green BOP represents values greater 30, Yellow BOP represents values from 30 to –30, and Red BOP represents values less than –30. Balance of Power is a registered trademark of Worden Brothers, Inc.